Contact Centre CRM Software — NexJ Systems Inc. In the financial services industry, contact centres are often a client’s primary source of contact with a company. Contact centre agents have a diverse set of responsibilities that include capitalizing on the interactions to grow business. Agents need to quickly identify clients, solve a wide range of problems efficiently, and, in many companies, suggest appropriate opportunities for cross-selling and upselling. As a result, contact centres require a comprehensive understanding of the client across the enterprise and unique CRM functionality designed to increase agent productivity and streamline the client experience. These capabilities include call flows with branching and decision trees, dynamic call scripts, configurable business rules, optimized screen pops with integration to CTI and softphone, as well as a blended view of service requests from all interaction channels. It also requires integration with multiple channels of interaction, including Click-to-Call, Online Chat, and Co-Browsing. NexJ’s Intelligent Customer Management products are designed specifically for the needs of both inbound and outbound contact centres, as well as blended agents that handle both inbound and outbound calls. It delivers a comprehensive client view, financial services CRM, and contact centre-specific functionality to improve agent productivity and to increase client satisfaction while improving the efficiency of the contact centre. 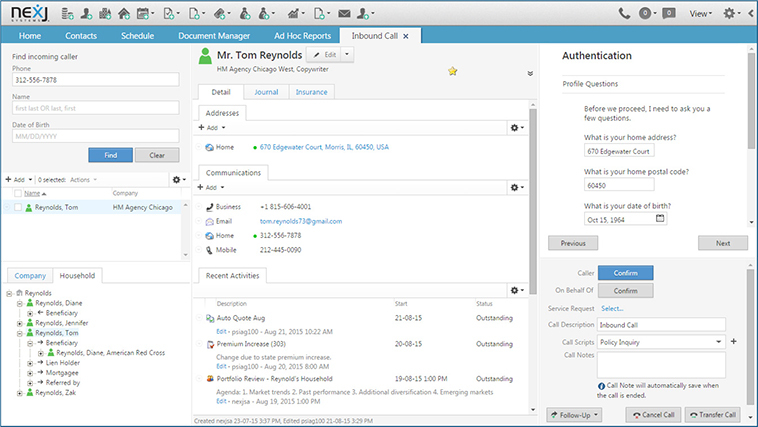 For example, users can leverage NexJ’s call list for inbound calls to set call dispositions on a particular lead. The disposition will suggest a next best action and update the lead status automatically. For outbound calls, NexJ’s Service Requests and Interaction Journal are leveraged to automate all call-related functionality for the user and across the enterprise. NexJ creates a service request record that tracks the incoming call, transferred calls, follow ups, and any call metrics. Additionally, NexJ’s intelligent customer management products can integrate call centre and chat functionality with profile, interaction history, plan, member, and transaction information in a single application. It provides users with the complete context for each interaction, including the reason for the call/chat, a filtered list of important interactions relevant to this contact (recent service requests, accepted offers, etc. ), and suggested next steps relevant to this contact. NexJ’s unique approach to call scripting means that users are not locked into a set call flow. Users have access to all information about the client. This allows users to find whatever information is needed to resolve the call – even if the caller does not follow the given call flow. This improves customer service and increases first call resolution rates.